Editor's note: An earlier version of this story incorrectly attributed comments by Richard Beyer, Bendix’s vice president of engineering and research and development, to another Bendix executive. As truck makers and technology developers work toward introducing vehicles with some level of automated driving features in the years ahead, it will be essential for drivers to have a clear understanding of what those systems can and cannot do and how much they can rely on them. One key concern is that drivers may place too much trust in limited self-driving systems designed with the expectation that the driver will remain attentive, or at least ready to resume control if needed. In fact, that risk has persuaded many developers of this technology to push toward higher levels of automation that no longer rely on the driver as a fallback in an emergency. The misuse of driver-assist features currently available on some passenger cars, as well as a crash involving a self-driving Uber SUV, have illustrated the challenges associated with relying on both a human driver and a computer program to pilot a vehicle. In April, a British man received a temporary driving ban after he was caught riding in the front passenger seat of his Tesla car while the Autopilot function was engaged and no one was sitting behind the wheel. Tesla’s current Autopilot system is a so-called Level 2 driver-assist feature that can automatically brake, accelerate and keep the vehicle centered in its lane. However, it is not a fully autonomous driving system; it still requires drivers to watch the road and keep their hands on the wheel. Inattentive drivers also present a risk for the testing of autonomous vehicles. In March, a self-driving SUV operated by Uber Technologies Inc. struck and killed a woman in Arizona. A widely viewed video of the incident shows that the test driver appeared not to be watching the road when the woman suddenly appeared out of the darkness directly in the car’s path. The crash is under investigation by the National Transportation Safety Board. Truck makers and technology suppliers that have been investing in the development of driver-­assistance and autonomous driving systems as a way to improve road safety also have been wrestling with the question of how drivers should interact with the technology. Much of the design efforts involve taking into account the potential risks associated with human inattention or system failures. In the immediate future, truck makers and suppliers said they seek to emphasize the safety of autonomous systems ahead of their deployment in test vehicles. Therefore, the vehicle must be ready to assume better control of the truck than human drivers, even before they are deployed in test environments, said Jason Roycht, a vice president at component and system supplier Bosch North America. For many developers of self-driving technology, the way to solve the challenge of safely transferring control between the driver and the machine is to bypass it altogether by building systems that no longer require the driver to remain attentive or quickly resume control in an emergency. Technology firms Waymo and Uber, along with a number of startups, including Embark, TuSimple, Einride and Starsky Robotics, are developing prototypes of so-called Level 4 automated trucks that can pilot themselves, at least under certain conditions, with no driver input. That would mean skipping past Level 3 automation, in which the vehicle is capable of driving itself without constant driver supervision but the driver must remain ready to respond to a request to intervene in a timely manner. The pursuit of developing autonomous trucks in which control may need to pass unexpectedly from the self-driving program back to the driver is futile and ultimately unsafe, said Kartik Tiwari, co-founder and chief technology officer at Starsky Robotics, a startup that is building self-driving trucks with remote drivers. In commercial transportation, fleets only will adopt automated driving technology if the business case makes sense. “We need to provide a total cost-benefit to the industry, which is the main driver for why the industry will pursue specific levels of automation,” Bosch’s Roycht said. Indeed, specifying when and where the truck will drive itself offers safety benefits and helps to solve the driver hand-off conundrum, said Richard Beyer, vice president of engineering and research and development at Bendix Commercial Vehicle Systems, a major supplier of braking and safety systems. Recent car launches serve as potential counter­examples of where limited Level 3 automation might have a place in trucking. German premium carmaker Audi’s new A8 offers Level 3 driving on highways at speeds of less than 37.3 mph. In a commercial truck, such capabilities might allow the driver to be more productive in stop-and-go traffic in metropolitan areas, said industry analyst Richard Bishop, president of Bishop Consulting. The driver could be able to do tasks unrelated to driving or rest while the truck steers itself for long periods of time in heavy traffic moving at slow speeds. Besides being easier to design compared with the engineering work required for high-speed Level 3 driving, the slower speeds lower safety risks. Downtime in the cab as the truck drives itself in low-speed traffic conditions for extended periods of time also potentially could enhance fleets’ productivity — if that time no longer counted against federal limits on driving hours. 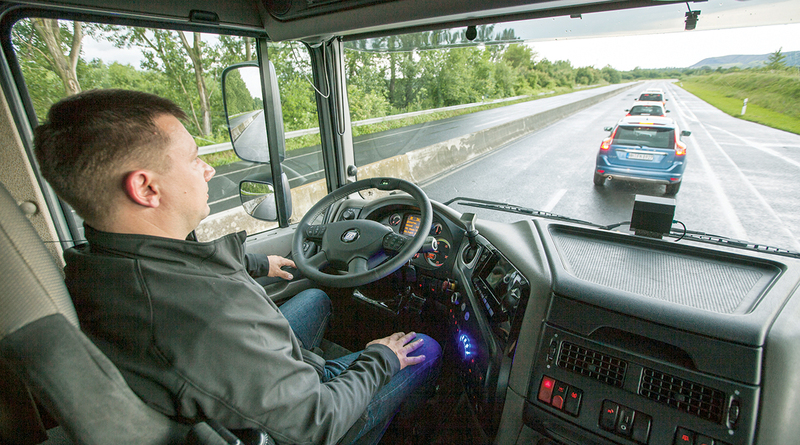 The case for allowing vehicles to pilot themselves while the driver remains ready to take control at any time, or Level 2 driving, is hard to make for commercial trucks, Bosch’s Roycht said. Among other things, additional training to teach drivers to overcome the human tendency to place too much faith in the vehicle’s self-driving system likely would not be worth the investment, he said. This would be added to the costs associated with the hardware and software that allow the truck to steer, brake and accelerate on its own while the driver still is responsible for monitoring the vehicle’s progress and traffic conditions. Despite the often hyped claims that driverless trucks are just a few years away, even the most advanced prototypes undergoing tests have limitations. The functionality of truck sensors, for example, still is limited to certain weather conditions. A truck that can drive itself in sunny conditions may no longer function in a tropical storm or in heavy snow. This means that even the most advanced autonomous trucks may require driver input at some point, or simply won’t operate in those conditions. When systems fail, Starsky Robotics’ Tiwari said human intervention, at least in theory, should not be necessary. Currently, however, Starsky’s test vehicles give a signal for the driver inside the cab to take over, similar to a Level 3 vehicle. But as the company refines its technology, it expects its trucks eventually will either be able to pull off the road safely, or, in the worst case, gradually come to a stop if no other option is available, he said. Redundant controls and systems also will be needed to monitor the vehicle and to react to emergency situations as needed. When the worst does happen and systems fail, trucks’ safety backup systems must be able to respond without input from the driver, said Dan Galves, chief communications officer for Mobileye NV. While it’s difficult to predict when various forms of automation will be ready for commercial launch, established truck manufacturers generally have said it will be a while before drivers will be able to completely hand over control to autonomous driving systems for long distances or extended periods of time.